Once upon a time, there lived a clever thief called Aladdin. Life is hard for a thief on the streets, and even moreso for a woman. 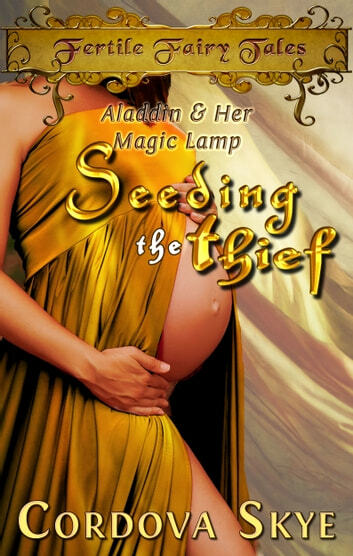 Orphaned and unprotected, Aladdin disguises her gender from all eyes until a sorcerer threatens to reveal the truth. His payment for silence is the theft of a simple oil lamp, but when he doublecrosses her Aladdin discovers that there is nothing 'simple' about the lamp or the genie it holds - a genie now bound to her every wish and wildest desire. Not content with wealth and status alone, Aladdin asks everything of her magical benefactor and may gain more than she ever dreamed in return. Seeding the Thief is over 5000 words of sweet and spicy romantic erotica, containing fantastic impregnation and accelerated pregnancy.